The secret sauce for marketing success…YOU! So you’re looking to buy something. A product. Or a service. You might end up on a website. Or a social media profile. Yes, you’re looking for product info. …what makes them different from the last business I just checked out? …how do they run their business? And most importantly of all… why should I buy from them? Sometimes entrepreneurs make the mistake of pretending to be something they’re not because they believe this will bring them sales. This is a big no-no for genuine (and successful) marketing. That’s not the way to stand out, to shine. The way to shine is to be yourself. There is nothing more important. You have to put the “you” in your marketing. When you’re being yourself, you’re not faking it. People can spot a phony from a mile away. Your message will be stronger and people will resonate with you when you’re speaking your truth. And it should make you feel good! No one can match you. Because only you are you. If you’ve been here for a while, you know that I’m into spirituality. Positivity. Love. Personal empowerment. And I share that kind of stuff from time to time. Yes, there are plenty of people out there who hate it. I might lose Facebook likes or email subscribers. And that’s OK. I am one internet marketing consultant out of about a bazillion. But if someone had the choice between me and someone else, and they are in tune with what I’m about and my values, then it makes it easier to choose me. I’ve differentiated myself based on who I am as a person. This kind of goes hand in hand with the point above. Not only will you stand out from your competition, but you will also be more memorable. So maybe someone is not ready to buy from you right now. But maybe they may be ready in the future. And you want your business or your name to be the one that comes to mind. The fact that my favourite place to hang out is the forest is a whole heck of a lot more memorable than the fact that I offer quality small business marketing services (yawn, you and how many other people?). When you attract your right people then it’s meant to be, business style! You can’t possibly be a perfect fit for everyone and their dog. So when you are being yourself you attract the right people for you and your business. Instead of just being some cookie cutter shape of what you think everyone wants you to be. And it will make it all easier when you’ve got your right people. Selling is easier. Delivering the right product is easier. The process is easier. Because you are in tune. Have you ever spent way too long on sending a simple message or even a tweet because you got a little paranoid of how you are coming across? If you just be yourself then you can stop double thinking simple tasks and let your personality shine through. Stop trying to be so darn professional! Marketing will all of a sudden seem so much more friendly. And more real! 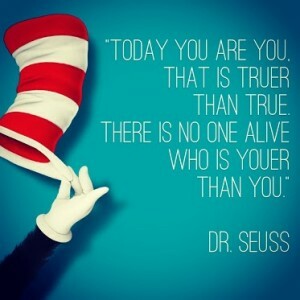 So how can you be yourself more? Social media: it’s now the #1 way to show who you are. And it doesn’t have to all be business on these internet marketing channels. Share pictures of you living your life. Share quotes or images that are in line with your values. Give your audience an inside peek into who you are. Website content: don’t overwhelm your visitor with all your business jargon and university essay style long paragraphs. Make it sound like you! And make sure you’re a part of it. If there’s a team, include bios. If it’s just you, share yourself. Don’t hide behind some bland, generic “about” paragraph in the 3rd person that makes you sound like a big corporation. You’re not. And you know what? In this day and age, with people waking up to the wonder of small business, it’s better that you’re not. Way better. Blog: bring yourself into your blogging. Share stories. Give personal examples. People love personal examples! This can be a wonderful way to add depth to a blog that may be of a techy or biz-focused subject. Promotions: Have a little something you’re stoked about? Promote it! Put on a special sale with proceeds going to your fav charity. Participate in or sponsor an event that is just the right fit for what you’re all about. Whatever, you do, don’t be shy about it! And be sure to share WHY you are stoked about it! Being yourself in your business life will not only be a feel good release from the stuffy professional box we try to stick ourselves into sometimes, it will also be good for your business. It’s a WIN-WIN. Customers are becoming very sharp when it comes to business character. The days of the slimy fake used car salesman telling the customer what he wants them to hear are over. In a world that is becoming mass marketed and fierce with business competition (I mean, hello, have you noticed HOW many of us are here on this planet! ), the only way to stand out is to be the beautiful, unique you that you are. And there is only one you. No one else is you. Now that’s what I call ORIGINAL! As a new small business this was such wonderful encouragement. Thank you so much! Thanks, Martina! I’m consciously practicing to be more personal and transparent in all my communication channels.